Shannon Kleibrink of Calgary won the women’s final of the Canada Cup, 6-4 over Marie-France Larouche of St-Romuald, Sunday morning at the Farrell Agencies Arena in the Gallagher Centre. Kleibrink, along with third Amy Nixon, second Bronwen Webster and lead Chelsey Bell earned $25,000 for the win, plus $3,200 for their four round robin wins, for a total of $28,200, finishing with an overall record of 6-1. It’s the second Canada Cup win for Kleibrink, who also won the 2005 renewal in Kamloops, British Columbia, as she becomes the first female skip to win two ‘Cups’ in its seven-year history. The first half of the game saw each team count and steal single points, as the fifth end came to a close knotted at two apiece. However, the defensive struggle opened up in the later ends. After another Kleibrink single in the sixth gave her team a 3-2 team, Larouche executed a nifty double take-out to blank the seventh end and retain hammer. The first deuce of the game was scored in the eighth, when, after Kleibrink failed to double out a pair of enemy rocks, Larouche calmly drew the four-foot to take a 4-3 lead for the first time. In the ninth, Kleibrink responded with her own deuce, drawing to the four-foot with backing after Larouche had made a nice angle raise to lay second shot. In the 10th, with two Kleibrink counters in the house, Larouche tried to force an extra end with a hit and stay in the eight-foot, but she rolled too far, giving up a steal and the game, 6-4. “The game today went pretty much how we sort of thought it would, a tight game,” continued Kleibrink. “They’re a great team. If you make a mistake, they could have run away with it. We just had to make sure we were on top of our game the whole time playing them. 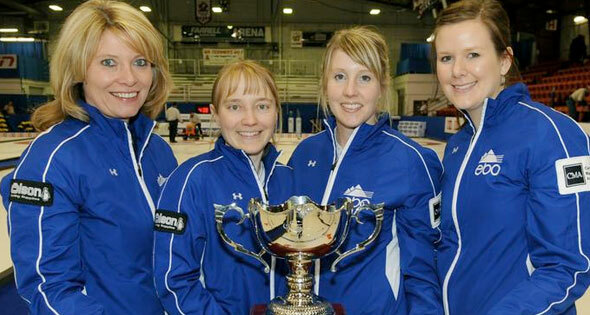 The Kleibrink team has already qualified directly into the 2009 Tim Hortons Canadian Curling Trials, December 6-13 in Edmonton, Alberta, which will determine Canada’s representatives for the 2010 Olympic Winter Games in Vancouver, by virtue of its three-year points total on the Canadian Team Ranking System. Kleibrink, of course, also represented Canada at the 2006 Olympic Winter Games in Turin, earning a bronze medal, after capturing the 2005 Tim Hortons Canadian Curling Trials in Halifax. To date, the only other women’s team to directly qualify is reigning world champion Jennifer Jones of Winnipeg. Two more teams to earn berths directly into the Trials will be confirmed by April 30, 2009. Larouche picks up $15,000 for finishing second, plus another $3,200 for her four round robin wins, for a total of $18,200. Her team has now officially qualified for the pre-Trials event in Prince George, British Columbia, November 10-14, which will determine the four other women’s teams (from the 12 competing) in the eight-team Trials field. Calgary’s Cheryl Bernard once again finished third at this year’s Canada Cup, which was presented by Richardson International, earning $12,400, while Regina’s Michelle Englot was fourth and received $7,400.